One of the guests is a newcomer to Willow Lake— Darcy Fitzgerald. Sharp-witted, independent and intent on guarding her heart, she's the last person Logan can see himself falling for. And Darcy is convinced that a relationship is the last thing she needs this Christmas.Yet between the snowy silence of the winter woods, and toasty moments by a crackling fire, their two lonely hearts collide. The magic of the season brings them each a gift neither ever expected—a love to last a lifetime. Ahhh...Christmas-time...one of my absolute favorite holidays of the year, and not just for the gifts! Christmas is all about love, family, cheer -- there's just something about it that makes you smile. Candlelight Christmas will bring you all those light-hearted feelings and more. This is definitely one of those books you could easily turn into a Hallmark Channel film. It's full of Christmas cliches, a little bit of cheesiness, and a story of redemption that makes you feel like anything is possible on Christmas Eve. 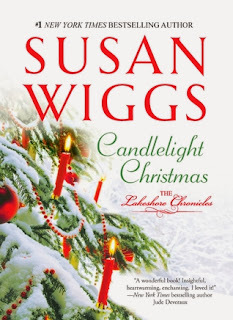 Candlelight Christmas is a great romance story that will tug at your heart and bring out some of your faith. Faith that anything...or anyone...can happen to you around the holidays. And that when it does...or when they come...you're not afraid to leap.